git-annex is available for Android inside Termux. This includes the git-annex assistant, for easy syncing between your Android and other devices. You do not need to root your Android to use git-annex. First, install Termux. This is an Android app that can run some Linux software in a terminal, including git-annex. To start git-annex, just run "git annex webapp" inside Termux. A browser window will open with the git-annex interface. The webapp does not need to be left open after you've set up your repository. 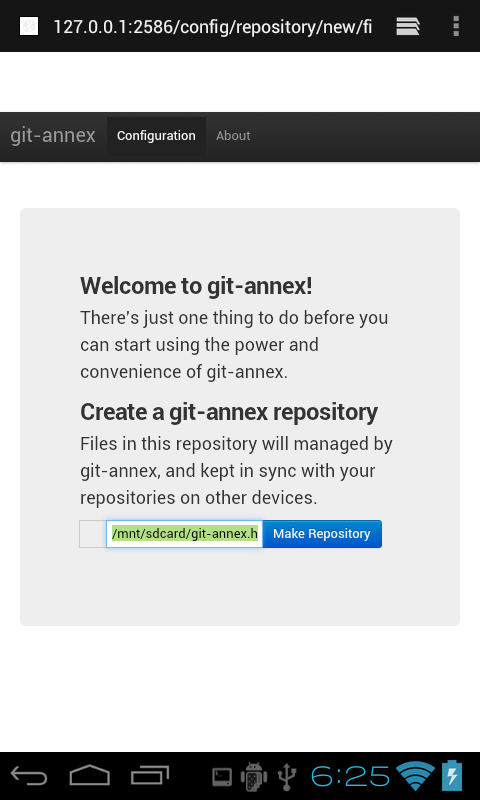 As long as Termux is left open, git-annex will remain running and sync your files. If you install the Termux:Boot app, git-annex will be automatically started when your Android device powers on. It will run in the background in whatever repositories you have set up in the webapp. You can go on to set up a ssh remote pointing to a server, and sync your files to and from it. And so on. Most ways you would use git-annex on a Linux system work fairly well in the Termux environment. To upgrade to a new git-annex release, just run git-annex-install again. If you are experiencing a problem using git-annex on Android, please examine the list of bugs and add a new, detailed bug report if no-one has reported the problem. If you are not sure if you have a bug, or need help in filing a good bug report, ask for help in the forum. I have moved to oldcomments a lot of old comments about problems that may be fixed or not (hard to tell without a bug report!) " This page cannot scale to handle every bug report that someone wants to paste into it. This seems to download a html. Thank you for reporting that, I have fixed the url. I'd again like to ask that, if you have any kind of problem or bug with this Android build of git-annex, you open a bug report rather than posting a problem here.